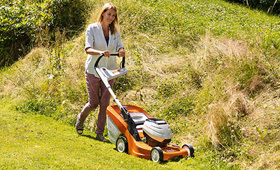 The innovative battery-powered lawn mowers enhance comfort as that they do not feature a cable and plug, allowing them to move freely throughout the garden. Their up to 41 cm cutting widths are perfect for lawns up to approx. 370 m². Moreover, the battery also fits other machines, such as STIHL hedge trimmers or brushcutters.